The lovely folk at GMC sent me another book to review. I've had it on my bookshelf for a while now as I was intending to make something from it. I'm not sure when I'm going to get round to it, so I thought it was about time I wrote the review. Before we go any further, the disclaimers. I was sent the book for free to review but I was not told what to say and all opinions are 100% my own. I didn't receive any monetary compensation. Links in this post, as with all my book posts, are affiliated. If you click over and buy something, I get a few pence towards an Amazon voucher. 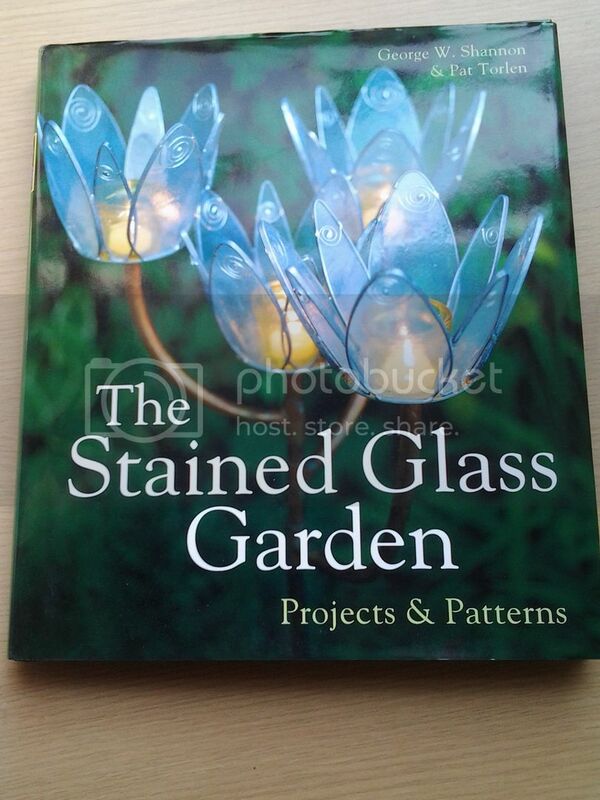 I love that project on the front cover, it makes me dream of having a garden full of beautiful glass pieces and mosaics... instead I've got a garden full of weeds and bunny poo! 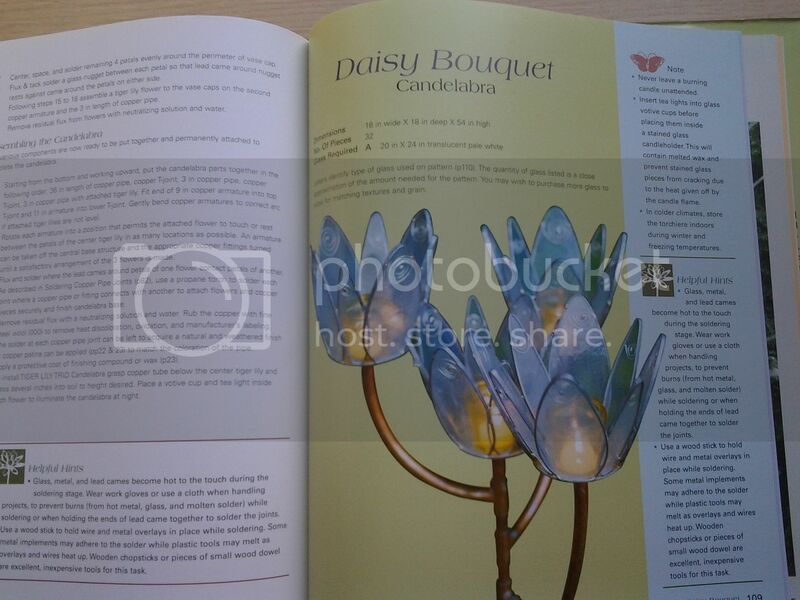 The book starts with 23 pages of instruction, hints and tips, covering how to work with glass, equipment needed and safety precautions. I'm not a glasswork beginner so I can't say whether these instructions would be good enough for a beginner, but anyone who's taken a workshop in glass work should be able to follow them easily. Next is a section on how to work with copper foil. This is a technique where you cover the outside of the cut glass pieces with strips of copper foil and solder them. This patio lantern project is one of the copper foil projects. 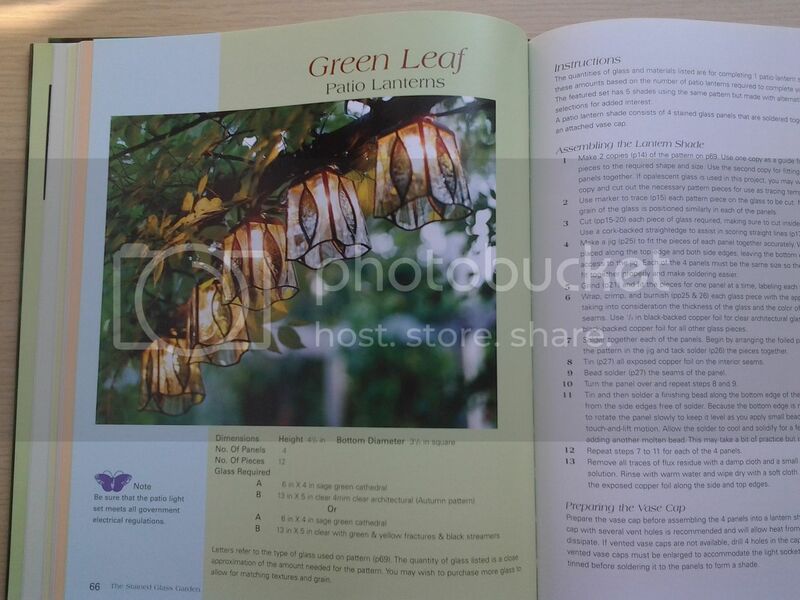 There are 14 copper foil projects in total including panels, garden stakes, mobiles and lanterns. The third section is about working with 3d Lead Came. 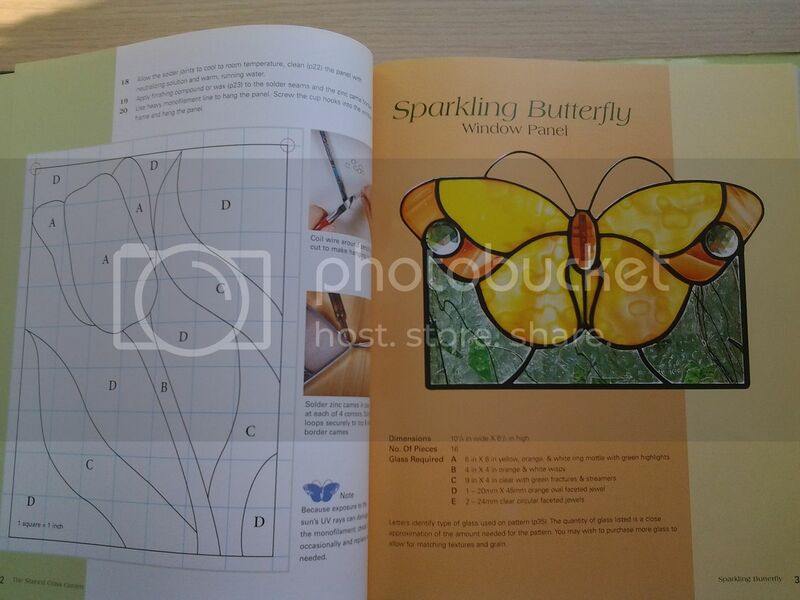 This is the method that I used to make my stained glass window, does anyone remember that project? 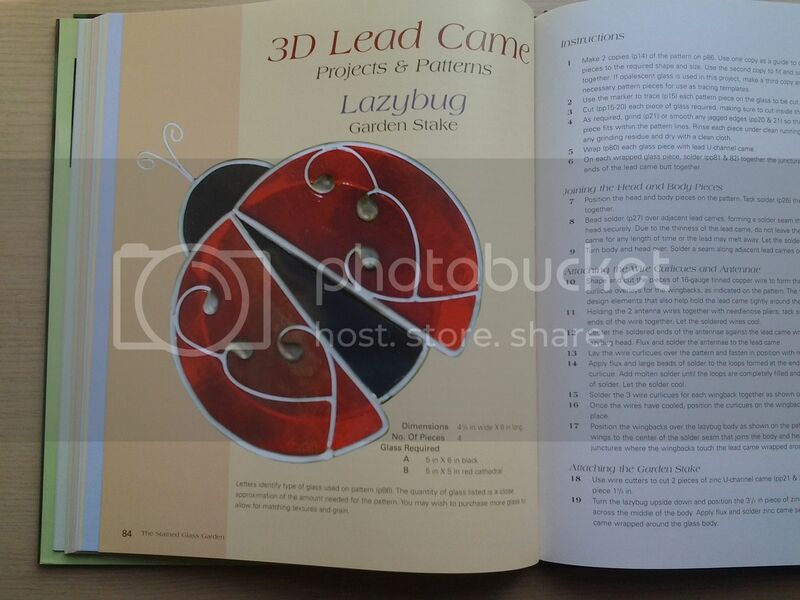 This ladybird plant stake is one of the projects in this section, it's my favourite in the book. The section begins with general instructions of how to work with lead cane, then moves on to 14 projects. This book is not for everyone as you need to be set up for working with glass. If you are a glassworker then I'd definitely recommend it. The projects are just lovely and I want them all in my garden! The instructions seem to be pretty comprehensive and include lots of tips along the way. I haven't made anything from it yet, but that doesn't stop me getting it out and flicking through it, dreaming of that perfect garden (which would still feature bunny poo...). I was given a review copy of the book by GMC however this review and all opinions are 100% my own, I was not told what to say. Amazon links are affiliate links. The projects do look enchanting! Must be interesting! would love to get one! 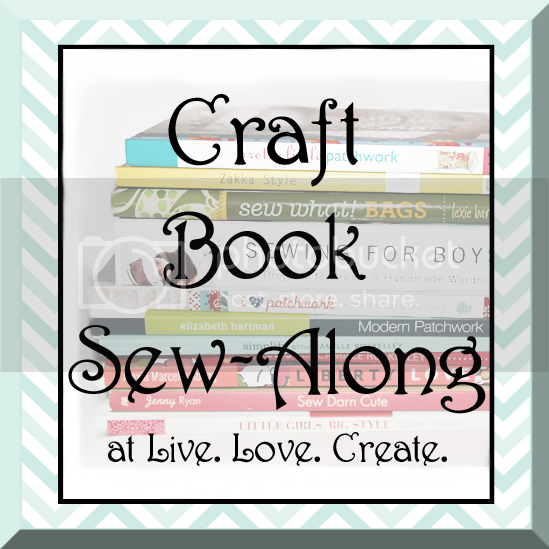 some lovely projects there, have you picked one out to try? Oh that book looks devine! Though I have never dabbled in that craft, I have always admired it. The daisy bouquet is lovely. These projects look wonderful. My husband has the stained glass work equipment but hasn't done many projects so I'm trying to get him interested in the book! Thanks for bringing it to my attention.